I have been eating peanut butter and jelly/jam since I was a kid, as most everyone has. We normally buy whatever is the cheapest because of how pricey they are these days. It never crossed my mind until recently that I could actually make something that I have enjoyed all of my life and it would be not only cheap, but low cal, sugar-free and actually taste good. 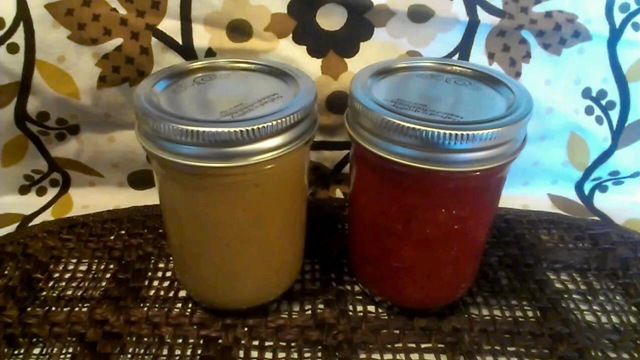 I’ve been making my own peanut butter for the last week and it’s been fine, but I didn’t make the strawberry jam until yesterday. It has sat in our pantry for the last 24 hours because, well, the person in the instructional video said to give it 24 hours lol. Also, I was kind of afraid of how it might taste. Why? Well because I have bought sugar-free strawberry jam and they don’t taste good… at all. I mean, they’re okay, I guess, but they aren’t great. When we came home from the movies today I had myself a half of a sandwich, just because I was curious and I was pleasantly surprised that it was actually good. So I got the recipe from the Ball website, but I had to go to SparkPeople to type in all the ingredients and servings to get the calories and it came up to 2.3 calories per 1 tablespoon, that’s if 1 8oz jar has 16 tablespoons, which according to my food calculator it does. Although the recipe says that 4 cups of strawberries makes 6 jars, I did the half recipe to make 3 jars and it actually only filled 2, so I had to adjust it for that missing jar and the calories only went up to 3.4 calories per tablespoon. So at least when you look at it from a caloric perspective, it’s basically just a big bunch of nothing, so eat all you want. The recipe calls for 4 cups of strawberries, 1 cup of unsweetened white grape juice (which I couldn’t find, all the store had was light which is what I used to calculate the calories) and 3 tablespoons of pectin. That’s it. If you made that recipe you’d end up with 4 jars, even though Ball says 6. 4 jars makes 64 servings. Yesterday I was thinking that perhaps I made a big mistake and that it’s probably not going to taste good at all without any sugar and that I would make the sugar recipe, but it actually tastes like real strawberry, and that is all you can taste. Real strawberry jam with a ton of sugar is good and all, but you’re not eating strawberries since half of it is pure sugar. You might as well pour sugar onto your bread. At least with this recipe you are getting the strawberries. And you can make it as chunky as you want, or if you don’t want any chunks you can just mash it all up. Either way it’s the way you wanted to make it. So yeah, I will never ever buy peanut butter and strawberry jam ever again for the rest of my life. I am even thinking about making strawberry and banana jam, see how that works out lol. Can you just imagine how good that would be? If you figure that the recipe calls for 4 cups of strawberries, just use 2 and 2 cups of bananas. Mash most of the bananas up, but then cut half of one of the bananas up so you get some chunks. Although I haven’t tested that theory, but you bet I’m going to lol. When strawberries aren’t in season I’m going to make some other jams, like maybe peach, apricot, blueberry, blackberry… and whatever other fruits they have that would make a good sugar-free jam. I love it when I have good ideas that work out.